The deer across the river pushed me into the river. I did not actually see this happen, but I am absolutely sure it was him. Who else could act so aggressively and maliciously against everything that I am? I do not mind being in the water, but to be suddenly (and without my consent) placed into the river? No. That is not good, and I do not like it, and I am so very angry at the deer across the river and how vile of a creature he truly is. I do not mean to come off so flustered, but this was a very bad experience for me. I smelled an interesting and strange smell coming from what was probably a bug or a leaf or maybe a neat rock across the river where I usually get water and look at my reflection. It was coming from where the deer across the river usually stands, mocking me with his knowing glances and horrible demeanor. Against my best interests, I decided to go to the interesting smell. I knew the risk: the deer could be there at any moment, and surely an experience with him would be incredibly upsetting. I liked the smell of whatever was there, though, and I was willing to risk a chance encounter with the deer to smell such a lovely smell up close. I swam across the river and climbed onto the ground. My paws got muddy as I hurled my wet nose into the soil, searching for the smell I had caught from across the river. I followed the lovely aroma to a tree that leaned toward the river. On one of the lowest branches of the tree sat a bug. I climbed to it, ignoring the tiny cracks of the tree that begged me not to. I told myself I would not spend too much time on the tree, so the cracking sounds could be ignored. I breathed in heavily to fill the insides of my bearness with the smell of this fascinating bug. I did this for awhile, and I was not interrupted by the deer during this crucial smelling experience (at least I can thank him for that, I suppose). The bug flew away eventually. When it did, It was time to go back to my side of the river, and I cautiously climbed back down to the ground, trying not to bend the branch anymore than I already had. I was surprised the deer was not around yet, but I accepted my luck and approached the river. Right as I tossed my first paw forward toward the water, I felt a rough jab against my backside. I slipped on the muddy ground and catapulted toward the river. With an embarrassing, enormous splash, I crashed into the water. My ears were instantly filled with water and anger as I desperately paddled my front paws to get to the surface. I knew who was behind this villainous act before my snout got to fresh forest air. The deer across the river. He stood where I had fallen. Beside him laid a broken branch. Surely it was his weapon of choice to commit this atrocity. He had even chosen the branch I had used to comfortably enjoy the smells of a new bug/possible friend. It was cruel. I made desperate growling sounds toward him as he puffed out his lips and made whatever you call the awful sounds deer make when they make sounds (it sounds like coughing but somehow more sickly and depressing). I got back to my side of the river. I stared at him until my fur began to dry. I wanted him to apologize for what he did, though I knew that would be impossible. I would settle for an admission to guilt, but I never got one. After some more hacking/coughing, the deer walked away. He left his weapon behind. You can also now use Tumblr to address questions to Bear. Also, you can find bear photos and such on Bear’s Instagram, and don’t forget to “like” Bear on the book of faces. 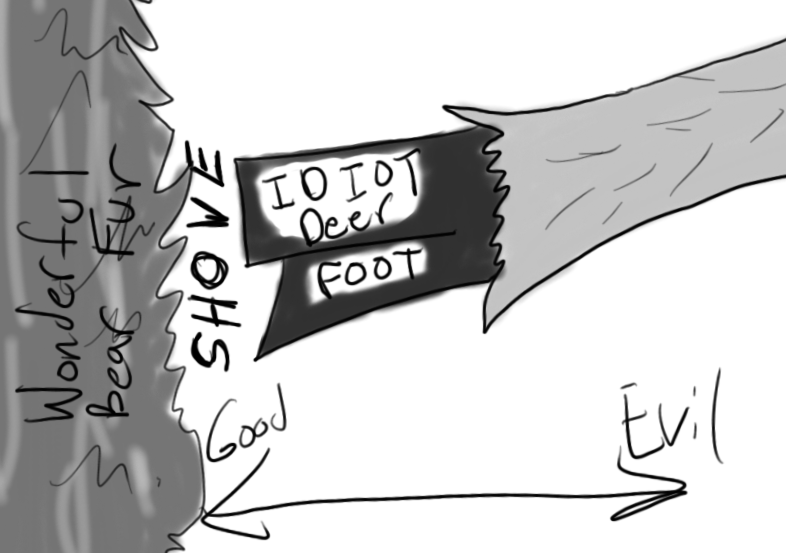 This entry was posted in Bear thoughts and tagged bears, bugs, deer are horrible, etc, humor, nature, new smells, the deer across the river, trees, vile creatures, water on August 15, 2016 by A bear. I’m sorry Bear! How incredibly rude of the Deer to do such a thing. Be ok Bear. Please just be ok. The bug sounds like a wondeful little friend. I hope you cross paths again soon and maybe the two of you can become better acquainted..